control measures are adequate, and if they are not, whether alternative risk control measures are justified or will be implemented. Risk assessment incorporates the risk analysis and risk evaluation phases. Risk management is considered as the complete process of risk assessment, risk control, and risk reduction. 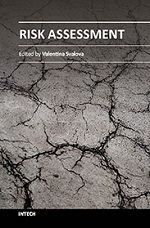 The book reflects on the state-of-the-art problems and addresses the risk assessment to establish the criteria for ranking risk posed by different types of natural or man-made hazards and disasters, to quantify the impact that hazardous event or rocess has on population and structures, and to enhance the strategies for risk reduction and avoiding.